"Would you wear Wright’s work on your sleeve? 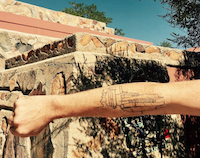 Or, do you have your own Wright-inspired tattoo? Be sure to share on social media, and tag @wrighttaliesin on Instagram and Twitter, and the Frank Lloyd Wright Foundation on Facebook!"